My situation oscillates between having too much time and not having enough time. I am very quickly moving into one of those not-enough-time periods so I’m going to post this now. Next Wednesday, I fly out to New Jersey to visit my sister. I will be there for the month of July so there are certain things I have to get done now, you know? I started with the two things I was most likely to put off closer to the time – washing the windows and washing the curtains. I will say two things: windows are much, much bigger than they look and curtains are much, much dirtier than they look. (And to the orange fungus growing on the sitting room window… I’m not sure whether to scrub you off with an ice-scraper or to make a peace-offering). Now I’m getting into the usual stuff like hoovering, doing laundry and making brownies for Alb for while I’m away. Yesterday, I returned library books and had a brief look in Pennys, with a mind to picking up some cheap holiday gear. I came out with pop socks and a pair of pyjamas because it was depressingly clear that Pennys Irish idea of summer and summer in NJ are two totally different things. Then I figured that I should probably wait until I am there anyway, because it’s not like I won’t go shopping and cheap as Pennys is, I’m sure there will be cheaper in NJ. Plus, the more room I have in my case going over, the more I can fit in coming back! Here’s some crochet for you. It is about the only thing keeping me going through all this rain. Although it looks like alot, I only have 8 squares. A blanket of any useful proportion will require 54. I think there will be some surprise cushion covers in peoples’ Christmas presents this year! 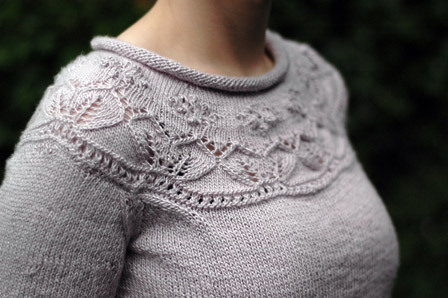 I finished my February Lady Sweater but I will wait for Alb to take photos of it. It fits ok but I’m not entirely convinced. Honestly, I think it makes me look pregnant in a covering-it-up sort of way, which of course is the best way to get people to wonder. I’ll let you decide for yourself tomorrow. I have been working on the romantically-named Design 23 from Noro Mini Knits since. I have the right front and the two little sleeves to do before making it up. I think it will be really nice and quite likely the only Noro colourway that I would wear on a regular basis. Ok. I have to go. The name of today’s game is obsession. 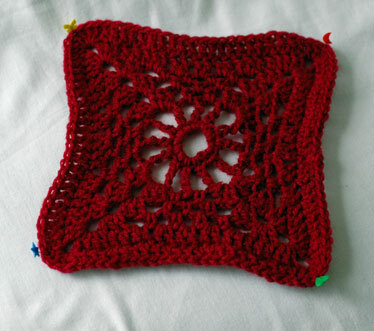 The past two weekends, I have had the great pleasure of teaching Beginner’s Crochet and Next Steps in Crochet with Charlene at This is Knit. 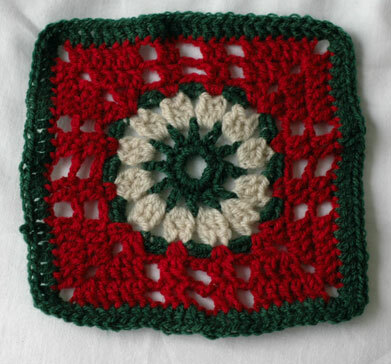 The demand for these classes pleases me no end because crochet has really gotten a bad rap. There is also a bizarre stigma attached to it by many knitters who believe that it is “hard”, “stupid” and simply “not as good as knitting”. 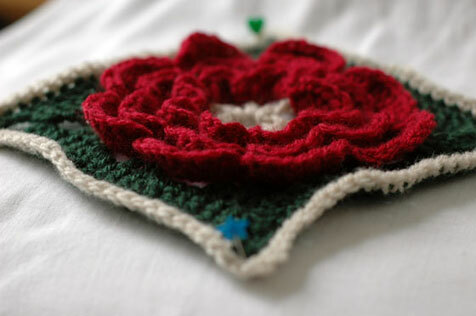 I think a lot of this is to do with the fact that crochet, like many other things, is much easier to understand when shown, as opposed to be being described in a book. 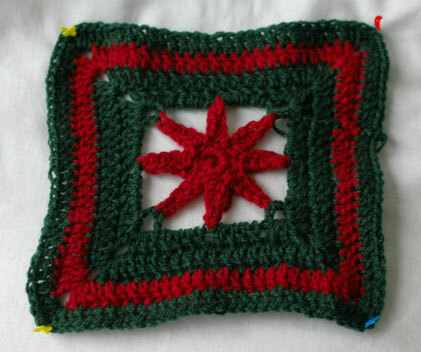 Anyway, Charlene loves to crochet squares and turn them into fantastic things like bags and she told me about a book called 200 Crochet Blocks. I picked it up yesterday on my way home from the class. Pretty, no? I have about 1500m of acrylic in my stash that I had intended for a light cardigan about three years ago. Looking at it in the drawer, I realised that I will have a sampler blanket for the sofa much quicker than I will have that cardigan. Each block in the book measures about six inches square and each block takes around 30 minutes to make up. 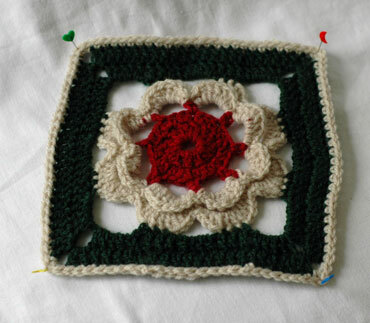 With 200 blocks to choose from, it all adds up to some pretty obsessive crocheting. 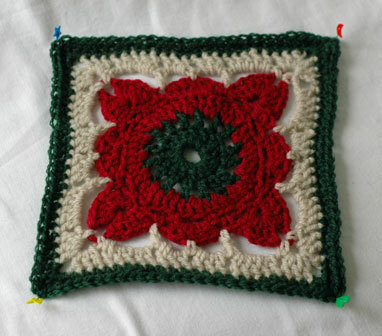 I’m really quite astonished because I thought I would never, ever make something like a blanket… but this is too quick for even me to get bored. I have been invited over to lovely Laura’s for dinner tonight so I have brownies to make. Maybe just one more square…. I associate happy memories with Elizabeth Zimmermann’s Knitting Almanac. I bought it in November 2006 in the Barnes & Noble on Union Square in Manhattan. I remember not even opening the cover before I bought it: I wanted to save it for the train home. I wended my way back to Penn Station, the streets all bright lights and shadows because it was coming up to Christmas. I stopped off to buy a pretzel and a coffee and I recall so clearly a businessman in the queue ahead of me, with his heavy wool coat, his shining briefcase and matching leather shoes, not a hair out of place, asking the woman on the till for golden dollar coins instead of notes. She didn’t have any – but I did, having received a deluge of change from the subway ticket machine that morning. I pulled at his sleeve and offered to swap him five coins for a note. He was so happy; he collected them. Settled and seated, I cracked open the covers and dove right in. Knitting Alamanc has a chapter for each month of the year and is interspersed with projects suitable for the month and personal writings from Zimmermann herself. I soon reached ‘February’ and the February Baby Sweater. Along with the Baby Surprise Jacket, this has become a standard Zimmermann baby knit – but I don’t know any babies and so do not knit for them! 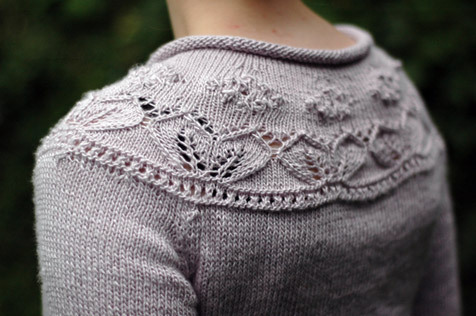 Therefore I was delighted to find an adult version here, thanks to Ravelry. 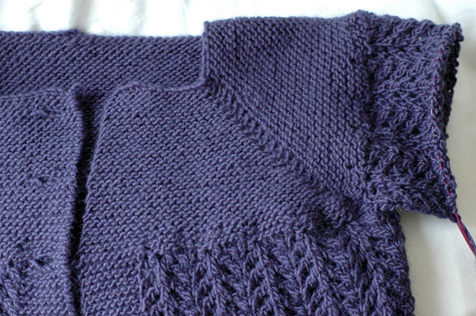 I am knitting mine out of Lamb’s Pride Worsted and I am really impressed with the drape of it. I started on the first sleeve last night. I’m not sure what length to make the sleeves. I will probably go with a baggy full length sleeve. Anyway, it was nice to dig out my Almanac and remember the smell of a shiny golden pretzel and that dazzling American smile. 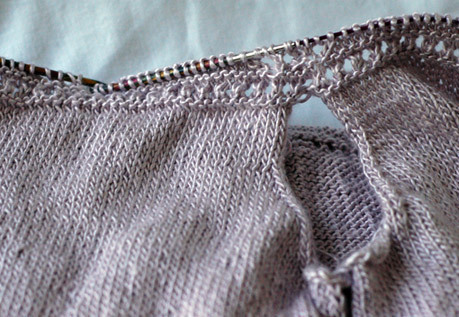 Pattern: Yoke Detail Sweater from Coastlines, by Debbie Bliss. Yarn: Pure Silk, 7 skeins (I made it longer in the body and sleeves). Modifications: Well, I knit the body and sleeves in the round. The sleeves and body parts have raglan shaping so that the back comes up higher than the front. It worked out really well, but it meant that after working in the round, I had to knit all four parts flat and then sew them up. It was pretty stupid but I couldn’t figure out a way to work it otherwise. In hindsight, I could have simply joined the sleeves and body together and worked some short rows on the back before starting the yoke. Some close up detail of the detail! I am really pleased with how it turned out and it is much warmer than I expected it to be! It has been an interesting few days. Let me start by showing you this. 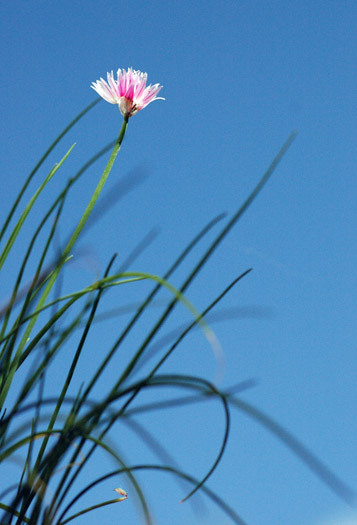 Did you know that chives flower? I didn’t! 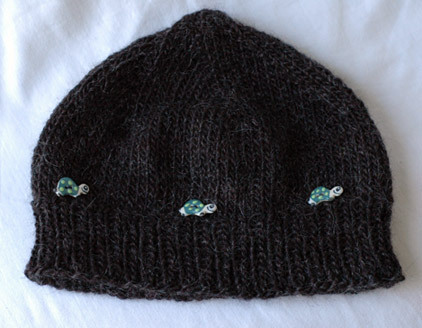 I finished my Turtles hat (ie, plain hat with turtle buttons sewn on) on Saturday afternoon. I know it looks a little bit pointy but it’s not noticeable when it’s on. Lamb’s Pride instantly won a place in my heart: it’s warm, it feels good, it’s great value for money and I love all the colours it comes in! I already have plans for other colours. 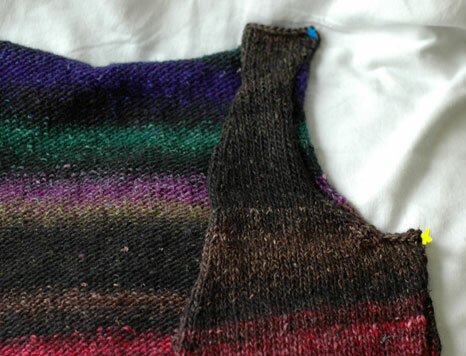 I finished one Tangled Yoke sleeve yesterday and have been plugging away at the Yoke Detail top. This afternoon, I finally joined all the pieces up and got started on the yoke. 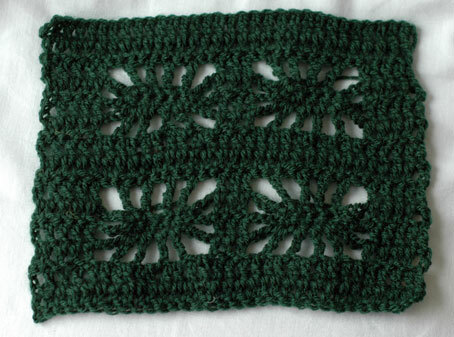 I’m going to save how stupid I think the pattern is for when I finish it. It’s a great idea, and a wonderful combination of yarn and design, but the way it’s written is driving me crazy. I was knitting on the bus out to This is Knit yesterday and, when we pulled up at Trinity, noticed a guy gaping at me through the window. It’s not the first time it’s happened so I paid no heed but when he quickly jumped on the bus before it pulled off, I became a little alarmed. However, it turned out to be a nice man from another country who simply could not get over the fact that people knit in Ireland. Although his enthusiasm was lovely, the reasons for his enthusiasm were depressing: upon coming to the country, he was dismayed at how materialistic and, well, alcoholic this nation is. So my knitting really cheered him up, even if he did alarm me a little. 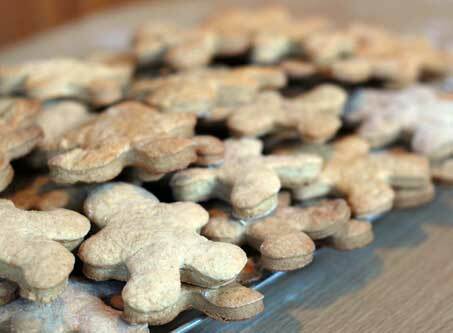 Remember that enormous pile of gingerbread men I baked before Christmas? 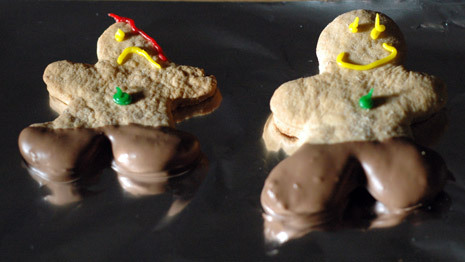 I dug the last of them out of the freezer earlier and decided to give them life (a.k.a. defrosting).